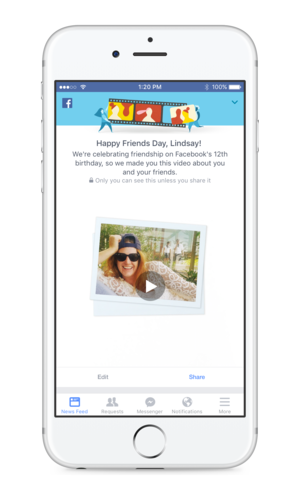 Facebook has declared its 12th birthday "Friends Day." It's a good excuse to look at old photos. Facebook expands live video to all iPhone users in the U.S. When you sign in to Facebook this morning, you’ll be greeted by a strange message: “Happy Friends Day!” If you’re wondering what Friends Day is, don’t worry—you haven’t missed out on celebrating this important holiday for your entire life. It’s a social media holiday that Facebook just invented to celebrate its 12th birthday. But you can join in on the pseudo-holiday fun. Facebook is creating personalized videos for every user, stitching together several photos of you and your friends so you can reflect on how great your relationships are. Or, in my case, wonder why on earth Facebook’s algorithm would choose such awful photos. Not to worry, though—if you hate the images Facebook selected for you, you can edit the video and swap in new photos before sharing it to your Timeline. No one sees the Friends Day clip until you post it. If this all sounds familiar to you, that’s because Facebook did something similar for its Year in Review videos a couple years back. In honor of its 12th birthday, Facebook also analyzed how connected the average user is to any other, and found that each person is separated by just 3.57 degrees. That number is down from 3.74 degrees, or people, in 2011. So basically, you’re closer to Kevin Bacon than you even realize. You can check out your own degree of separation to other Facebook users when you log in. Mark Zuckerberg is separated from the average user by 3.17 degrees. Check out how the network calculated those numbers here. Why this matters: Facebook now has 1.6 billion monthly active users and has collected tons of information surrounding us and how we interact with each other. Some of that leads to really cool data points, like the degree of separation, and some of it leads to the interactive Friends Day videos you won’t be able to escape this week.